There are many job boards that can help you find an actual job from home, but is My Home Job Search one of them, or just another online scam? My Home Job Search was created by Michael Anderson (which is a fake persona). He says he wanted to help people find the real money making opportunities online. It consists of two membership levels, free and paid. The free version gives you access to many links for online money making opportunities, online survey sites, and also pulls jobs from real listings in your area. The paid version allows you to unlock certain job board features and support, but costs $29 ($99 full price). Should you fork over your credit card for the one time fee of $29? Just from looking at the site, you can tell it is very fake. It has links to social media profiles such as Facebook, showing nearly 500,000 likes, but when you try to click to see their Facebook page it doesn’t go anywhere. In fact, when you try to search for the program on Facebook you will find out they actually don’t have a Facebook profile at all. What is actually inside the Home Job Search platform? When you dig into the actual program, at least the free version, it doesn’t get much better. 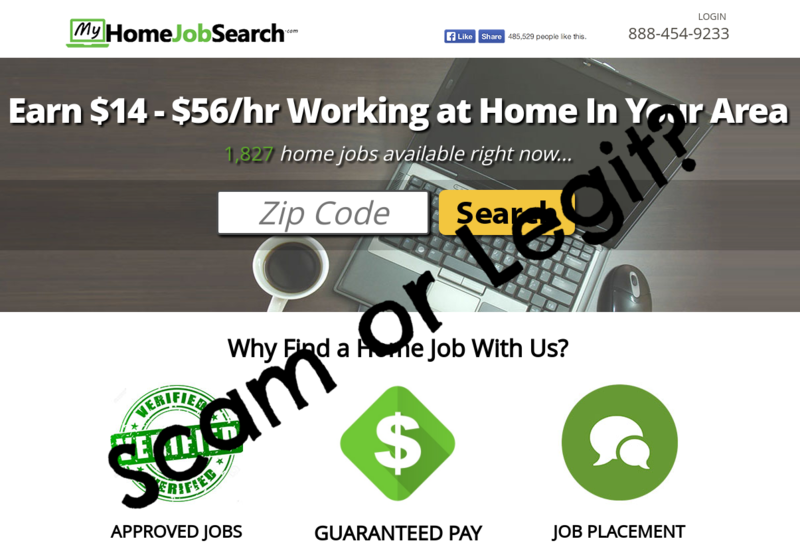 While it does give you links to legitimate survey websites such as Survey Junkie, Swagbucks, Global Test Market and many others, those are not at all the “jobs” this program claims you can find. Going further, there are several links to questionable make money online programs under the “make money” section. When I tried clicking them, they all took me to the exact same sales page claiming I could earn $379 per day with an easy system. You’re also given access to a job postings stream from your area (whatever zip code you entered when you signed up) and while they are real jobs, they are just regular job posts you could access from Career Builder or Indeed. They are not for online jobs. I did find some decent links within their Resources section. They link to Flexjobs.com, which is actually a legit online job board (although it’s members only). If you are seriously looking for actual at home job positions, that is a site I can recommend. You have to pay for access, but they only list real opportunities for actual companies that hire you as an employee or independent contractor. It’s not another list of phoney make money online opportunities or online survey sites, which is what many “online job boards” tend to do. There are also links to sites like Fiverr and Upwork, which are perfectly legitimate. These are websites for freelancers looking to advertise their skills like writing, graphic design, art, etc for people looking to hire them for small (or long term) projects. The one bad link within their resources is MyFlexJob which is in my opinion a scam. It’s very easily confused with Flexjobs, but it is in no way the same and there is NO connection. However as I clicked the link from their site, it seems as though the program must have been taken down (or moved to a different domain, different name). So where are the real online jobs they talked about on the sales page? Their unique job boards are locked and reserved for paying members, but I wouldn’t bet money you’d find real jobs even if you paid. Judging from what I’ve seen available to free members, I would think the paid version of this program would only lead you further down the rabbit hole of online scams. This program seems to be a fake show with no actual substance. Programs like My Home Job Search don’t exist to actually help you find a real work at home job, they run you around in circles trying to get you to sign up for as many different online programs as possible in hopes of some quick cash. Are you looking for REAL work at home jobs? If you’re looking for an actual at home job, I wouldn’t waste your time with this fake site. A job board I’d actually recommend checking out is Flexjobs. They provide you up to date job postings and all them are guaranteed to be real. In other words, it won’t be crammed full of online survey sites or make money opportunities which often time disguise themselves as being online “jobs”. While you can definitely find these postings for free if you look hard enough, Flexjobs does all the “hard work” for you. There are also places like Leapforce or Lionbridge that hire for at home work. If you are looking for an opportunity to make your own income online, but sick and tired of all the scams, I suggest checking out my #1 educational opportunity.